One prediction is off-the-shoulder wedding dresses, blush colored wedding dresses and flowers in the hair. This tends to lean towards a more simple, earthy feel for the bride – lace is also making a comeback which adds to a more simple look as well. Another trend is the open back wedding dresses or plunging V necks – when they are refined and not too revealing, these can slim the figure and narrow a broad shoulder – they can be stunning! Bridesmaid dresses are also seeing a big shift — gone are the same dresses for all bridesmaids – now it is trendy to choose a similar color or color palate and allow each girl to get a dress that compliments her body type. Allowing this for your bridesmaids can also increase the chances that she may wear the dress more than once. 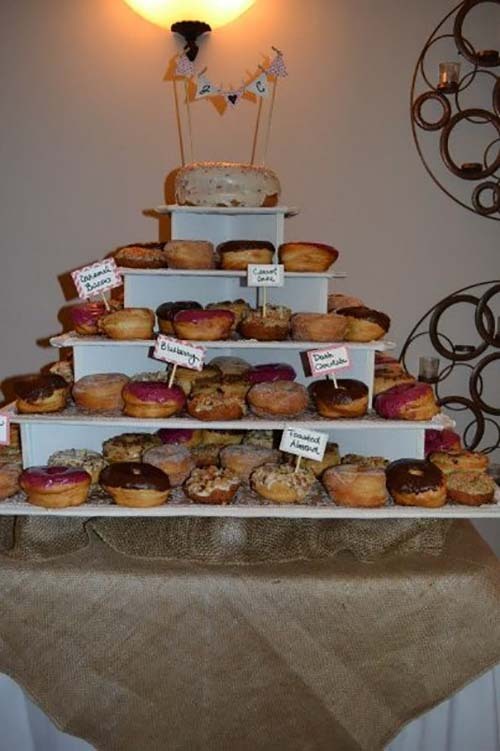 Wedding cakes are being replaced with other sweet options such as Macaroons, Doughnuts, Cupcakes and much more. 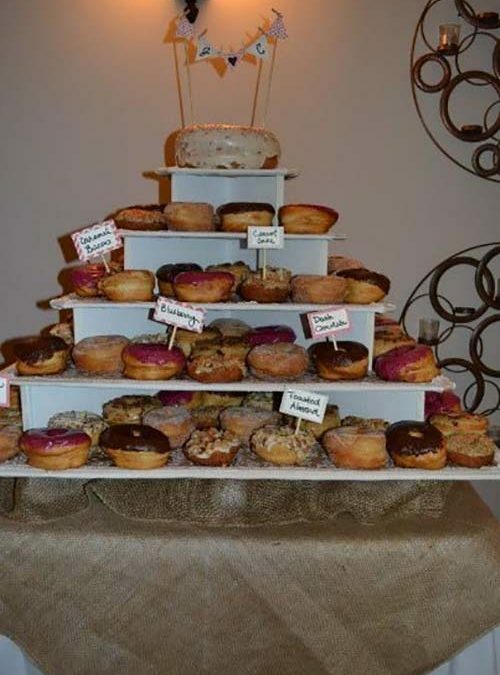 These options can still be placed into a stacked manner that resembles that of a cake but is much more cost effective and easier for guests to eat than the traditional cake cutting ceremony. Couples can always opt to have a cake for themselves and other options for their guests. The color palate is trending in two different directions – one towards more blush colors and cream flowers and/or greenery and the other towards vibrant colors. Many woodsy elements are also being added such as sticks, wood and moss. This can be a show stopper if done correctly! It is also becoming more popular for a cascading bouquet this year over the more trendy tight, rounder bouquets. Finally, a big money saver is to serve brunch instead of dinner. These types of foods are usually more cost effective, can serve a larger crowd of people for less money, and is usually a hit with guests. Food bars are also a hit where the guests have an array of choices to dress a certain dish the way they like it. For example, a grits or waffle bar – there are many different options you could offer guests that would tailor their dish to their liking. These options can also be provided in a grab and go cocktail glass that your guests can walk around and eat while they mingle. A sit down meal can often times raise the price of a meal with regards to dishes, service, etc… Event facilities can charge extra for additional service personnel if your wedding party is large; however, a buffet or food bar can help to cut some of that cost. The drink of choice with a brunch? Mimosas! This can also be a cost effective way to offer alcohol to your guests at a much discounted price with just one type of alcohol and orange juice. Whatever you decide with regards to your wedding and/or reception, we are sure it will be beautiful! A bride is always beautiful and at the end of the day, you are married! Remember that Gala Event Facility allows you to make individual choices, use your own chosen vendors if desired, bring in your own alcohol and decorate our facility to your liking. These are options that other wedding venues do not offer very often.